Kamaraj (Tamil : காமராஜ்) (A film on the kingmaker) is a 2004 Tamil biographical film directed by Balakrishnan made about the life of the Indian politician K. Kamaraj from Tamil Nadu, widely acknowledged as the "Kingmaker" in Indian politics during the 1960s. He was the chief minister of Tamil Nadu during 1954-1963 and a Member of Parliament during 1952-1954 and 1969-1975. Kumaraswami Kamaraj, was a leader of the INC, widely acknowledged as the "Kingmaker" in Indian politics during the 1960s. He served as INC president for two terms i.e. four years between 1964–1967 and was responsible for the elevation of Lal Bahadur Shastri to the position of Prime Minister of India after Nehru's death and Indira Gandhi after Shastri's death. 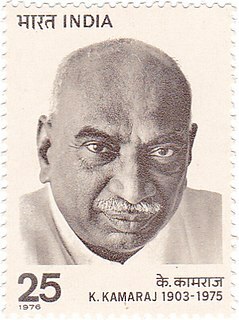 Kamaraj was the 3rd Chief Minister of Madras State during 1954–1963 and a Member of Parliament, Lok Sabha during 1952–1954 and 1969–1975. He was known for his simplicity and integrity. He played a major role in developing the infrastructure of the Madras state and worked to improve the quality of life of the needy and the disadvantaged. Ilaiyaraaja is an Indian film composer, singer, songwriter, instrumentalist, orchestrator, conductor-arranger and lyricist who works in the Indian Film Industry, predominantly in Tamil. Widely regarded as one of the greatest Indian music composers, he is credited for introducing western musical sensibilities in the Indian musical mainstream. Reputed to be the world's most prolific composer, he has composed over 7000 songs, provided film scores for more than 1000 movies and performed in more than 20,000 concerts. Being the first Asian to compose a full symphony with the Royal Philharmonic Orchestra in London, Ilaiyaraaja is known to have written the entire symphony in just 13 days which has never been done before in the world. He is also a gold medalist in classical guitar from Trinity College of Music, London, Distance Learning Channel. According to Achille Forler, board member of the Indian Performing Right Society, the kind of stellar body of work that Ilaiyaraaja has created in the last 40 years should have placed him among the world's Top 10 richest composers, somewhere between Andrew Lloyd Webber and Mick Jagger. The narration is divided into three phases. The pre-Independence period, depicting Kamaraj's childhood, the influence of Satyamurthy, Kamaraj's growth as a politician and his prison life. The second phase depicts his taking over as the Congress Chief Minister of the state, the reforms he tries to bring in, especially in education, his largesse and his bending the rules for a good cause-like for the urgent eye-operation of a kid. It also displayed his sense of humour (like his response when his mother in the village sends word that she needed a fan and a blanket), his refusal to take advantage of his position (asking for the newly installed tap to be removed from his village-house). The third phase where he puts forth the Kamaraj Plan, resigns from the post of CM, involves himself in party work; his influence on national politics, his emergence as a kingmaker and finally his disillusionment with the emerging non-ethics in political life. The closing scene (taken from the record files of the actual funeral), show swarms of humanity mourning the death of their beloved leader. J. Alexander, known professionally as Mahendran, was an Indian film director, screenwriter and actor, known for his work in the Tamil film industry. Mahendran is regarded as one of the greatest film makers of Tamil cinema and has influenced several filmmakers of the generations followed. K. Rajaram was an Indian politician of the Dravida Munnetra Kazhagam (DMK) and later, All India Anna Dravida Munnetra Kazhagam (ADMK) and Member of the Legislative Assembly of Tamil Nadu. He served as the Speaker of the Tamil Nadu Legislative Assembly from 1980 to 1985. V S Raghavan was a Tamil actor, who has acted both in Tamil films as well as television, had started his career as a dramatist and stage actor and went on to act as a character actor in films, starting with Vairamali (1954) and over 1000 films in all. He has also acted in numerous television series. He died on 24 January 2015. Charuhasan is an Indian film and television actor, director and retired lawyer who has acted in Tamil, Kannada, Telugu, Malayalam and Hindi films. He won the National Film Award for Best Actor and also the Karnataka Government's Best Actor Award for the Kannada movie Tabarana Kathe, directed by Girish Kasaravalli in 1987. Charuhasan is the elder brother of veteran film actor Kamal Haasan. Muthupettai Somu Devar Bhaskar is an Indian actor. Before entering to film, he was a theatre artiste, he made his film debut in 1987 in a small role in the film Thirumathi Oru Vegumathi. This was followed by several films in the 90's, in which he appeared in very minor or small roles. He has appeared in supporting roles in Tamil films and as a comedian in Tamil TV series. After he got film breakthrough in Engal Anna (2004). Then he is regular cast and widely recognised supporting and comedy actor in Tamil cinema. In 2013, Balakrishnan revealed that the film would have a re-release with fifteen extra scenes edited into the film. Richard Madhuram's death in 2005 meant that his son Pradeep Madhuram essayed scenes which needed the protagonist while Vijayakumar was featured as Periyar. Scenes were later digitalised and extra portions featuring actor Samuthirakani were filmed in June 2014. The updated version of the film was re-released in July 2015. Vijayakumar is an Indian Tamil actor and politician. He has started his filmy career in 1961 from the movie Sri Valli as a child Actor. He became popular in the seventies. He has started playing a lead role from the movie Aval Oru Thodar Kathai (1974) then he worked in Madhurageetham (1977) and Azhage Unnai Aarathikkiren (1979). He has acted in a few Hindi, Malayalam and Telugu movies. He also works in television serials like Thangam, Vamsam, Talambralu and Nandini. Popular films of Vijayakumar are Agni Natchathiram (1988), Kizhakku Cheemayile (1993) and Anthimanthaarai (1996). He has worked in more than 400 films in Tamil and Telugu Cinema. He has performed roles of lead role, negative role, supporting role and villain in various movies. P. Samuthirakani is an Indian film actor and director who predominantly works in the Tamil film industry besides appearing in a number of Malayalam films. He worked as an assistant to director K Balachander. His 2009 directorial Naadodigal was a runaway hit, which was later remade in three languages. He has acted in several films as well and is best known for his performances in Subramaniapuram, Easan, Saattai and Oppam. He won the National Film Award for Best Supporting Actor in 2016 for Visaranai. The film featured five songs composed by Ilaiyaraaja. Song lyrics by Mahakavi Subramania Bharati, Vaali, Ilaiyaraaja. Conjeevaram Natarajan Annadurai, popularly called Anna or Arignar Anna, was an Indian politician who served as 1st Chief Minister of Tamil Nadu for 20 days in 1969 and fifth, and last Chief Minister of Madras from 1967 until 1969 when the name of the state of Madras was changed to Tamil Nadu. He was the first member of a Dravidian party to hold either post. Ravi Mohan, better known by his stage name Jayam Ravi, is an Indian Tamil actor who works in the Tamil film industry. The son of veteran film editor Mohan, Ravi made his debut as an actor in the romantic drama film Jayam (2003), directed by his elder brother Mohan Raja and produced by his father. The success of the film prompted the title to become a prefix to his stage name, and he continued to collaborate with his brother for other films including Jayam (2003), M. Kumaran S/O Mahalakshmi (2004), Unakkum Enakkum (2006), Santhosh Subramaniam (2008), Thillalangadi (2010) and Thani Oruvan (2015)..
Mudhalvan is a 1999 Tamil language Indian political action thriller film written, produced and directed by S. Shankar. The film features Arjun Sarja, Manisha Koirala and Raghuvaran in the lead roles with Manivannan, Vijayakumar and Hanifa portraying other significant roles. The film featured an award-winning soundtrack composed by A. R. Rahman, cinematography by K. V. Anand and dialogues by Sujatha. Raja Paarvai is a 1981 Tamil-language Indian romance film directed by Singeetham Srinivasa Rao. Loosely based on the 1972 film Butterflies Are Free, the story was written by Kamal Haasan, for whom the film was his 100th as an actor, and first as producer. The score and soundtrack was composed by Ilaiyaraaja. The film was simultaneously made and released as Amavasya Chandrudu in Telugu. Despite being a box office failure, the film received critical acclaim, and Haasan's performance won him the Filmfare Award for Best Tamil Actor. Uthiri Pookkal is a 1979 Indian Tamil-language drama film, written and directed by J. Mahendran. The script was based on a short story titled Chitrannai by Pudhumaipithan. It starred then newcomers Vijayan, Ashwini, Madhumalini, Charuhasan, Master Haja Sheriff and Baby Anju in prominent roles while Sarath Babu plays a cameo. The soundtrack and background score were composed by Ilaiyaraaja. Ashok Kumar handled the cinematography, while B. Lenin made his debut as an independent editor with the film. Kuselan is a 2008 Indian Tamil language drama film directed by P. Vasu. A remake of the Malayalam film Kadha Parayumbol (2007), it was produced by Pushpa Kandaswamy, Aswani Dutt and G. P. Vijayakumar in two languages. Kuselan stars Pasupathy and Meena in lead roles. Rajinikanth plays an extended cameo role. The film was simultaneously made in Telugu as Kathanayakudu, with most of Rajinikanth's scenes being dubbed from the Tamil version except the climax scene that features him alongside Jagapathy Babu. Periyar is a 2007 Tamil biographical film, made about the life of the social reformer and rationalist Periyar E. V. Ramasamy with Sathyaraj who himself is a rationalist in the lead role. This movie was partly funded by the then Tamil Nadu government headed by Karunanidhi. Tamil National Party was a short-lived political party formed in 1962 in Tamil Nadu, India. The party finds its roots with the split in Dravidar Kazhagam after which Dravida Munnetra Kazhagam (DMK) was formed. E. V. K. Sampath, a founding member of the Dravida Munnetra Kazhagam, left the party following differences with the party leadership. The differences arose due to the DMK's stance on achieving an independent nation out of Indian Union called Dravida Nadu. Nevertheless, within years the Tamil National Party was merged with Indian National Congress. The fourth legislative assembly election of Madras State was held in February 1967. The Dravida Munnetra Kazhagam (DMK) led coalition under the leadership of C.N. Annadurai won the election defeating the Indian National Congress (Congress). Anti-Hindi agitations, the rising prices of essential commodities and a shortage of rice were the dominant issues. K. Kamaraj's resignation as the Chief Minister in 1963, to concentrate on party affairs, along with persistent rumours of corruption had weakened the incumbent Congress Government. This was the second time after Communist Party of India winning Kerala assembly elections in 1957, for a non-Congress party to gain majority in a state in India, and the last time that Congress held power in Tamil Nadu. It was the first time a party or pre-election alliance was formed a nob-Congress government with absolute majority. It marked the beginning of Dravidian dominance in the politics of Tamil Nadu. Annadurai, who became the first non-Congress chief minister of post-independence Tamil Nadu, died in office in 1969 and V.R. Nedunchezhiyan took over as acting chief minister. The second legislative assembly election to the Madras state was held on 31 March 1957. This was the first election held after the linguistic reorganisation of Madras state in 1954. Indian National Congress and its leader K. Kamaraj won the election, and defeated its rival Dravida Munnetra Kazhagam. In 1954, due to the resignation of C. Rajagopalachari, for his controversial Kula Kalvi Thittam, the leadership of Congress was contested, between K. Kamaraj, and C. Subramaniam. Eventually, K. Kamaraj, won the support of the party, was elected leader and chief minister of Madras State in 1954. In a surprise move, he appointed both M. Bhaktavatsalam and C. Subramaniam, in his cabinet, allowing great unity amongst Congress, that ruled the state of Madras, for the next decade. This election saw future DMK leaders, M. Karunanidhi and K. Anbazhagan winning their first MLA seat in the legislative assembly. The third legislative assembly election to the Madras state was held on 21 February 1962. The Indian National Congress party, led by K. Kamaraj, won the election. Dravida Munnetra Kazhagam made significant in-roads in the election and emerged as the second party for the first time by winning 50 seats. The second legislative assembly election for the Madras Presidency after the establishment of a bicameral legislature by the Government of India Act of 1935 was held in 1946. The election was held after 6 years of Governor's rule starting from 1939, when the Indian National Congress government of C. Rajagopalachari resigned protesting Indian involvement in World War II. This was the last election held in the presidency - after Indian independence in 1947, the presidency became the Madras state. The election was held simultaneously with that of the Legislative Council. The Congress swept the polls by winning 163 out of 215 seats. The years after this election saw factionalism in Madras Congress party with divisions across regional and communal lines. Competition among T. Prakasam, C. Rajagopalachari and K. Kamaraj resulted in the election of Prakasam as the Chief Minister initially. But he was later defeated by Omandur Ramaswamy Reddiar with Kamaraj's support. In turn, Reddiar himself was ousted to make way for P. S. Kumaraswamy Raja with the support of Kamaraj. The second legislative council election for the Madras Presidency after the establishment of a bicameral legislature by the Government of India Act of 1935 was held in March 1946. The election was held after 6 years of Governor's rule starting from 1939, when the Indian National Congress government of C. Rajagopalachari resigned protesting Indian involvement in World War II. This was the last direct election held for the Madras Legislative Council in the presidency - after Indian independence in 1947, the presidency became the Madras state and direct elections to the council were abolished. The election was held simultaneously with that of the Legislative Assembly. The Congress swept the polls by winning 32 out of 46 seats. The years after this election saw factionalism in Madras Congress party with divisions across regional and communal lines. Competition among T. Prakasam, C. Rajagopalachari and K. Kamaraj resulted in the election of Prakasam as the Chief Minister initially. But he was later defeated by Omandur Ramaswamy Reddiar with Kamaraj's support. In turn, Reddiar himself was ousted to make way for P. S. Kumaraswamy Raja with the support of Kamaraj. Madras State was a state of India during the mid-20th century. At the time of its formation in 1950, it included the whole of present-day Tamil Nadu, Coastal Andhra, Rayalaseema, the Malabar region of North Kerala, and Bellary, South Canara and Udupi districts of Karnataka. Coastal Andhra and Rayalaseema were separated to form Andhra State in 1953, while South Canara and Bellary districts were merged with Mysore State, and Malabar District with the State of Travancore-Cochin to form Kerala in 1956. On January 14, 1969, Madras State was renamed to Tamil Nadu, meaning "Tamil country". Vilai is a 2010 Tamil drama film directed by G. Kamaraj. The film features Saravanan, Bharani, Udhayathara and newcomer Ritu Soni in lead roles, with Fathima, Charmila, Shathiga, Krishnamoorthy, Gemini Balaji, Rajasanthuru and Devaraj playing supporting roles. The film, produced by M. Sathia and S. Babu, had musical score by D. Imman and was released on 27 August 2010. 1 2 3 "Kamaraj". Chennai Online. 11 June 2004. Archived from the original on |archive-url= requires |archive-date= (help). Retrieved 27 June 2016. ↑ "A great biography on celluloid". p. 02. Retrieved 27 June 2016– via The Hindu (old). ↑ Oppili, By P. (3 September 2004). "Call for entertainment tax waiver". p. 06. Retrieved 27 June 2016– via The Hindu (old). ↑ RANGARAJAN, MALATHI (8 October 2005). "A message goes global". p. 01. Retrieved 27 June 2016– via The Hindu (old). ↑ "Samuthirakani Bags Key Role in Tamil Biopic Kamaraj" . Retrieved 27 June 2016.